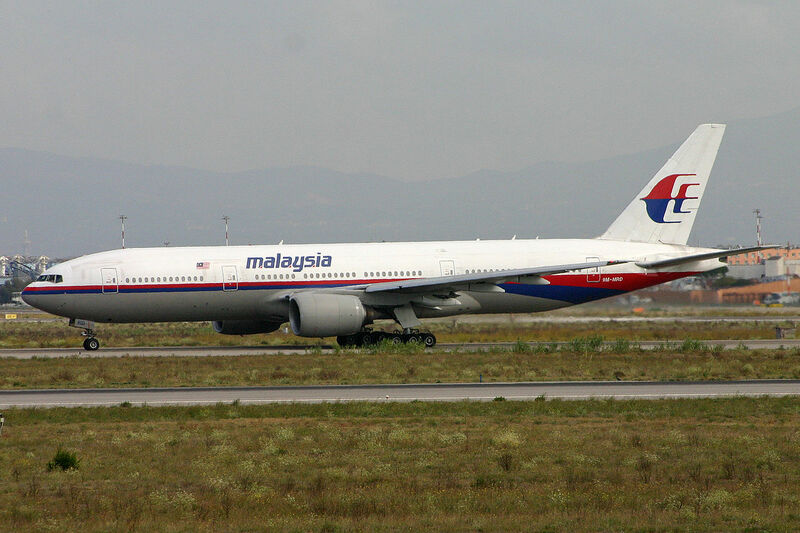 Malaysian Boeing 777 9M-MRD shot-down over the Ukraine 17 July 2014.
Who are these Donbass separatists? They are comprised of the Donetsk and Lugansky People’s Republics, pro-Russian groups who would like to see two eastern regions of the Ukraine, Donetsk and Luhansk Oblast, secede from Ukraine like Crimea. They gained attention for seizing the Donetsk Regional State Administration government building and several other government buildings in the wake of the 2014 Ukrainian revolution. In continued fighting between the pro-Russian separatists and Ukrainian military personnel, at one point separatists captured the main terminal of the Donetsk International Airport and shot down a Ukrainian Air Force Ilyushian Il-76, large military transport carrying troops and military equipment. In what sense are they “terrorists”? Apparently only in that they want their region to be part of Russia. The Oxford Dictionary defines “terrorism” as “the use of violence and intimidation in the pursuit of political aims”. (3) It would seem it is time for a better definition. The American colonies were willing to use force to secure freedom and liberty. Americans tarred and feather British sympathizers. They were “revolutionaries” but they were not “terrorists”. The southern states had a strong political opinion on state’s rights and were willing to leave the Union to protect them. They were “secessionists” but they were not “terrorists”. To put it in perspective, the 298 casualties of Flight 17 only barely make it the deadliest airliner shoot-down in history. Until this month, that dubious distinction was Iran Air flight 655 that was shot down by the U.S. Navy. The Navy mistakenly identified the Airbus A300 as a hostile Iranian Air Force F-14 fighter jet. All 290 onboard were killed. Yet, no one would say the U.S. Navy is a terrorist organization. No one except perhaps Iranian mothers who lost their only sons. This brings us to the problem of cavalierly labeling things “terrorist” acts. Whether on the lips of Iranian mothers or Ukrainian diplomats, it seems the word terrorist has been watered down to mean anyone who disagrees with your political viewpoint. The downing of Flight 17 was very sad byproduct of the ongoing military conflict in the eastern Ukraine but it was not an act of terrorism. Certainly there are Jihadist willing to take down civilian commercial airliners as the world tragically saw on 9/11. The problem is when we label any border skirmish or political upheaval as “terrorism” it masks the nature and extent of the problem. This makes it easy for New Atheists like Sam Harris to make bold statements like religion is “antithetical to our survival” due to terrorism. (4) However, the reality is much of what is being labeled “terrorism”, such as the tragedy of Flight 17, has nothing whatsoever to do with religion. The reality is the elimination of religion would have contributed absolutely nothing in preventing the tragedy of Malaysian Flight 17. The tragedy reminds us that terrorism is not synonymous with religion.